Need inspiration for your new year? Want to get excited and motivated to set a new year’s resolution? With the days counting down to the New Year, we’re all ready and excited for the amazing things in store for us! Oh, all the adventures we’ll take and the new memories that we’ll make. Whether you’re into making New Year’s Resolutions or not, I know you have expectations for 2019. It’s impossible not to! Even the most cynical among us silently wish the New Year will be an improvement on the last. 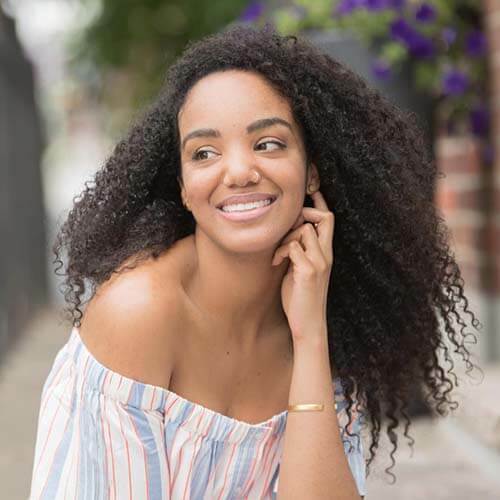 Will 2019 be the year you’ll finally quit your job and start that business? Perhaps the year you’ll fall in love or perhaps finally stop making excuses for being unhealthy? The possibilities are endless for you, as there are countless unique New Year’s Resolution ideas for you to choose from! Whatever your hopes for yourself a fantastic place to start your New Year is with a dose of Inspirational New Year’s Resolution Quotes and Sayings. 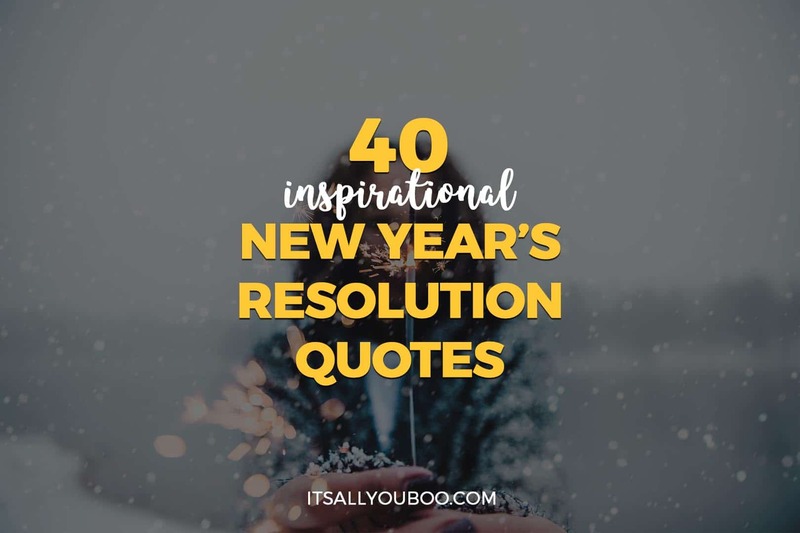 Each of these famous New Year’s Quotes will inspire you to get excited and motivated to make 2019 your year. They encourage you to look forward, let go of the past and put your best foot, heart, and soul forward into the new year. The New Year is a new adventure, a new chapter in your life. 365 days of new possibilities and opportunities just waiting for you. This collection of new year quotes and sayings inspire you to see the new year as a fresh start and new chapter in your life, just waiting for you to fill it with new experiences. Each New Year brings new hope! Let go of the disappointments of what didn’t happen, leave your regrets in last year, and step forward emotionally with a spirit of hope and thankfulness. This collection of inspirational New Year quotes and sayings presents the new year as your opportunity to hope again. 7. “Each year’s regrets are envelopes in which messages of hope are found for the New Year.” – John R. Dallas Jr. The New Year is a time to renew yourself! It’s time to reset your mind and your thoughts go forward with a new way of thinking. It’s not about pretending everything is okay, but it’s about putting aside your harmful and hurtful tendencies like negative self-talk, gossiping and hated. 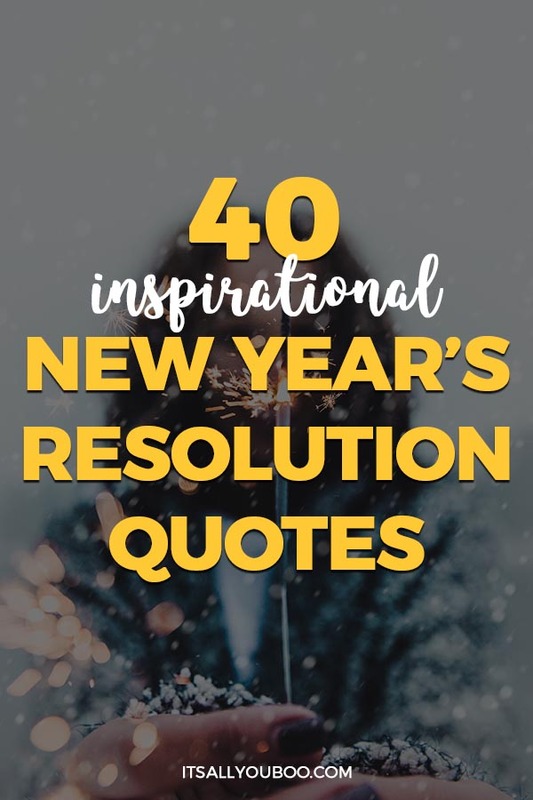 This collection of inspirational New Year Quotes and Sayings reveal that the purpose of the new year is to renew your thoughts, behaviour, and language. Need a New Years Resolution idea? Or maybe not convinced New Year’s Resolutions are even your thing. Here’s an idea – keep it simple this year, focus on loving yourself and others more, to get to know yourself better and to complain less. This selection of New Year Motivational Quotes is all about the resolutions you should be making this year. Choose to love, choose to complain less, choose to make daily resolutions. Want to make changes in your life in the new year? Then don’t just make resolutions, set goals and take action. The following Motivational New Year Quotes and Saying implore you to seek out new opportunities, to set goals, to take action and most importantly stick with your resolution. Don’t just set it and forget it, do what you must to make it happen. The New Year is a time to make mistakes and getting it right. Keep your New Year’s Resolution or break it! Sometimes in order to figure something out, you need to make mistakes and fail along the way. 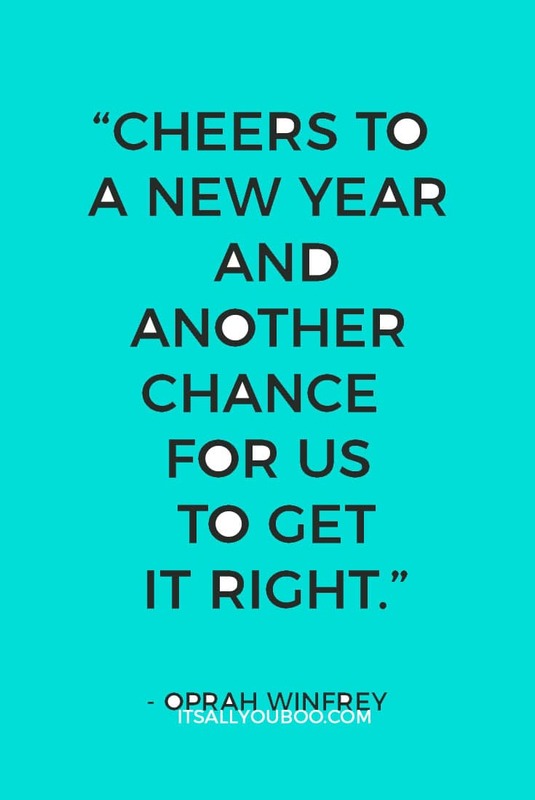 These famous new year resolution quotes and sayings encourage you to mess up and get it right! Be brave, either way, you’re learning and gaining wisdom. Isn’t that what matters in the end. Are you feeling inspired to make a 2019 New Year’s Resolution? Let next year be the year you make a New Year’s Resolution that really matters to you! 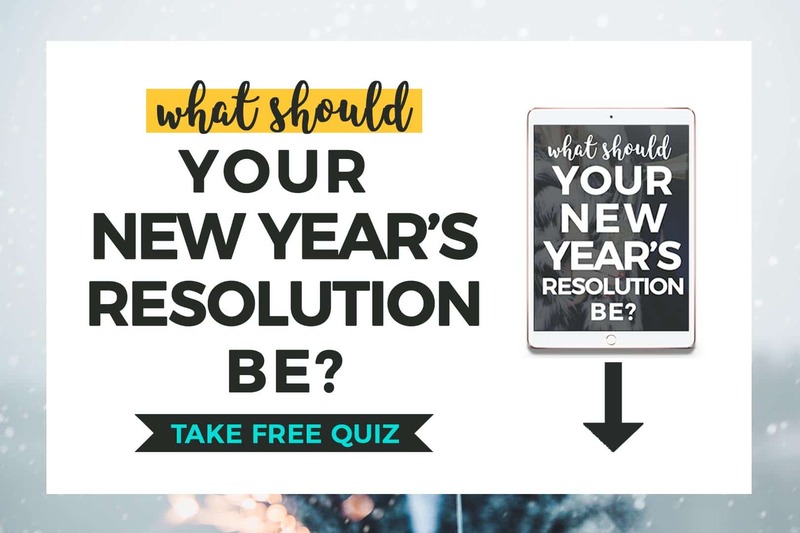 Take the New Year’s Resolution Quiz and discover what area of your life you should focus + get unique resolution ideas. 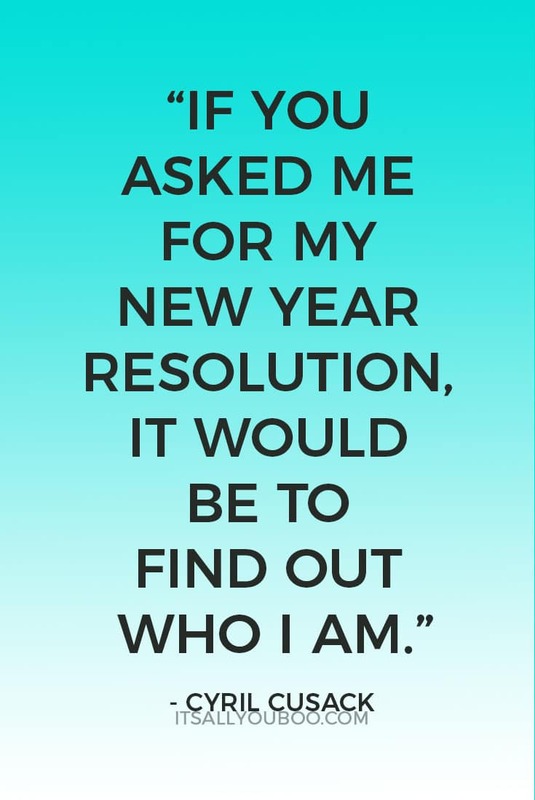 What’s your favorite New Years Resolution quote or saying? Aren’t they! I love anything C.S. Lewis too! You are so right there is nothing magical about turning that calendar page, it’s just the fresh start that we all need so much! Set goals and taking actions is so much better than setting resolutions! Exactly! And the GREATEST part about it is that any day we can decide to start again. And even more importantly, to take action as you say. I have written several of these down to bring into the new year with me! That’s awesome, Alexandra! 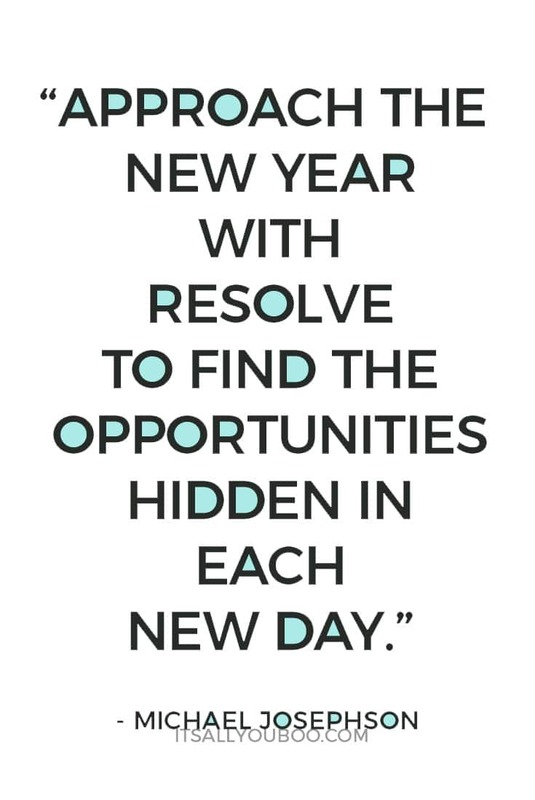 These inspirational New Year’s Resolution quotes are perfect for our journals and planners. Me too! I think that’s my favorite New Year’s Resolution quote and saying too! Be at war with your vices, at peace with your neighbors, and let every new year find you a better man. Year’s end is neither an end nor a beginning but a going on, with all the wisdom that experience can instill in us. Your success and happiness lies in you. Thanks for some quotes for New Years. That’s a truly inspirational New Year’s quote! It certainly is a “going” on and we do take the best and all the lessons we’ve learned with us. I just love motivational quotes they definitely put you in a great mood and I think they are definitely a great way to start of 2018. I have started setting my goals and actions for 2018 and I am already looking forward to it. You are right it is like starting a fresh book. I so agree, motivational quotes are a great way to start the new year. Best of luck in 2018 with all your goals and actions! I love quotes that make me think, laugh and push forward. Thanks for these. I definitely need to get started on my New Year thoughts. I can’t believe it’s almost here! 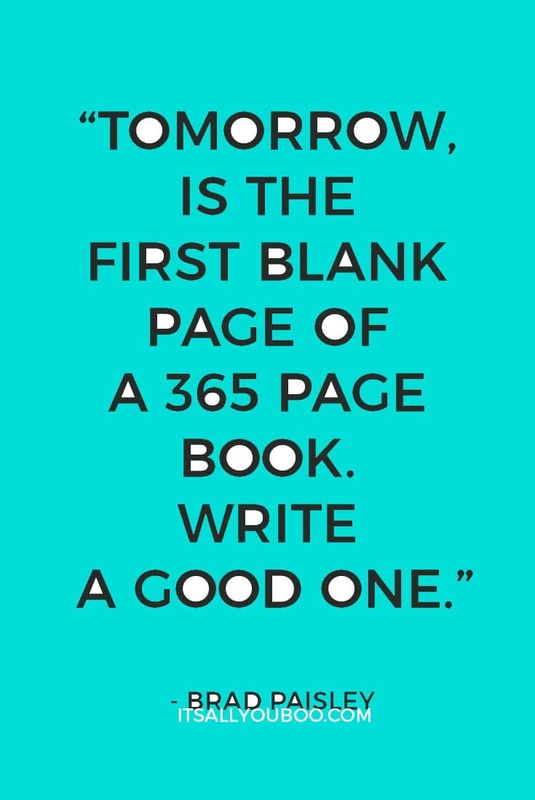 That’s great, love that you’re enjoying these inspirational new year’s quotes. It sure is. Happy New Year! Glad you enjoyed it, Amrita! Happy New Year! Thank you so much for sharing this inspirational quote. Can’t wait for 2018. Looking forward to the coming year. A lot may happen but every year is definitely full of blessings and learning. Awesome post! Me neither, I’m so ready for it and all that it has in store. This post is full of amazing quotes, which is a great way to enter the new year. I have had an amazing New Year’s morning with many new subscribers. My favorite quote is #29 “Character is the ability to carry out a good resolution long after the excitement is passed” because discipline helps the success follow the hard work. Check out my blog ayounglegend.com about how I graduated high school and college at 16 years old! That’s so inspiring! Glad you’ve found the post helpful. To get myself exercising again, I put a calender up in front of my treadmill and I take note of how far I’ve gone on each date, trying to beat the previous month’s overall record each time. It’s held pretty solid for two years now. What a way to track your progress and stay motivated! I love it, I really need help with my fitness goals. I’m good at other types of goals, but getting moving and working out. Not so much! It’s such an on point one too! Becuase if we know one thing, it’s that the excitement is sure going to wear off sooner than we like. Self-discipline is everything! 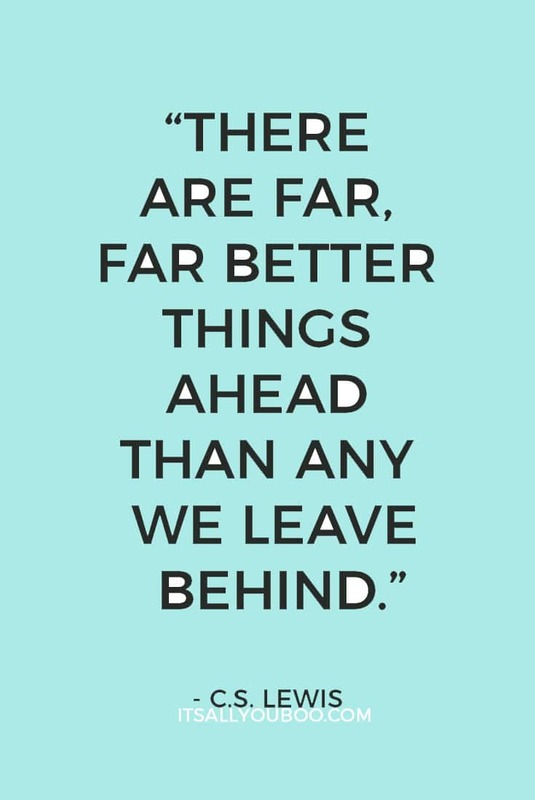 These are great quotes to start off the new year! I’m not really a new year’s resolution type person, but it’s still a great time to start off with a fresh perspective. Best of luck to you this year! Happy New Year! Aren’t they though? I seriously love quotes and these are some of my favorites. Agreed, a fresh perspective is always welcomed. Love all of your new years quotes! I adopted a quote of the year for myself and love it. My favorite however on your post here is the very first one! I saw there somewhere recently and LOVED it! It’s so very true! You know I picked that as the very first one for a reason – it just had the pop of new year’s to it that I wanted to start the post with it. Happy 2018! Yes, I love these New Year quotes and I need to save this post and remember many of these for myself. I love number 31, Approach the New Year With resolve to find new opportunities hidden in each day. Bookmark away! Sometimes you just need that encouragement and having quotes on call are great. Cheers to new opportunities in 2018! I have not been one to actually pledge to do or change anything in the new year. I am however the type that probably should as I constantly seem to put my own needs on then backburner but I need to take care of myself in order to take better care of everyone else. So with that said, the new year will be more of a year to focus on ME Time, well that is what I want to do anyway, we will see how this goes! Wishing you a happy new year with some time for YOU ahead of everyone else. Take care of yourself so you can really take care of others. Cheers to saying yes to me time! I love all of these quotes. This time of the year always brings me the opportunity to re-evaluate what is important. I love this time of the year. Happy New Year. So glad you enjoyed the quotes, Censie! I feel you on that one, it’s the PERFECT time to refocus and review, so we can have the best possible year. Isn’t is sooo true though? It is all about the follow through and doing whatever you can to make it happen. Let’s 2018 be the year of the follow through. I’m so pinning this! One of my favorites is the John Burroughs quote, “One resolution I have made, and try always to keep, is this: ‘To rise above little things.” This is one of the toughest things to do sometimes, especially with the huge political divide, but it’s worth striving towards. YES, thank you for pinning! You don’t even know how THIS has been my thing for 2018. I am just not even going to open my mouth anymore, just letting silence be my response. It’s rather effective I find. These are all amazing quotes. The 365-page book one is my favorite, I also like the one where it “resets” each day. Favoriting to look at throughout the year. It’s one of my favourites too! It’s the first quote in my Slay Your Goals Planner I love it that much. These are great quotes – every single one of them! I’m making it a point this year to read an affirmation daily! I really like #18. We focus so much on changing the things around us that affect us physically, but what about spiritually?? Hmmm. isn’t that so poignant though? We are always looking outside of ourselves, we should spend more time meditating on the inside. I’m a SUCKER for quotes! This post is fantastic, New Year or not! Thanks for taking the time to put these together! Hahaha me too, me too! Clearly, from all these quote posts I do. You’re so welcome. Happy New Year! I love the quotes that you have collated. I also do expectation setting every start of the year. I check if I attained my goals at the end of the year. Hey Emmanuel! Glad you enjoyed the quotes. Love these quotes that get me up and going, fueling ambition and passion. Wonderful! Thank you! Yes to ambition and passion in 2018! Those are some indeed inspirational quotes. I love reading all of it. Wishing you best of luck this 2018. Happy 2018 to you too Elizabeth! I’ll surely use a lot of your quotes in my daily life…motivation!thank you so much for this! Amazing quotes on New Year Resolution but We should not only think to change ourselves in New Year we should also change ourselves everyday. These quates have something auspicious in themselves ,which tend me to write it up in my quotes diary.